What is the Protein Pancake Mix? The Myprotein pancake mix is a ready to make delicious high protein snack, containing a combination of three different types of protein, whey, milk and egg protein. What are the Benefits of the Protein Pancake Mix? A high protein content means the Myprotein protein pancake mix contributes to the growth and maintenance of lean muscle mass, whilst also providing a low glycaemic index (GI) and the option for a great tasting snack. 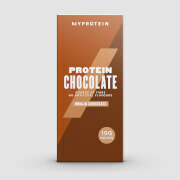 Each 50g serving will provide over 34g of protein. Who is Protein Pancake Mix suitable for? These protein pancakes are ideal for anyone looking for an easy way to increase protein intake. 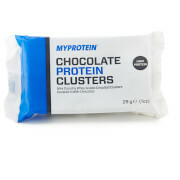 Myprotein's pancake mix is generally used as an option for breakfast or as a nutritious snack in between meals. Add 50g to 100-150ml milk or water and mix together. Heat a frying pan over a high heat and add a small amount of oil/butter then reduce to a medium heat and add the batter to the pan and cook. Please enjoy this product as part of a healthy, balanced diet and an active lifestyle. Store in a cool, dry place out of direct sunlight. Chocolate Flavour: Protein Blend (31%) (Whey Protein Concentrate (Milk), Milk Protein Concentrate, Egg White Powder), Ground Oats (13%), Cocoa Powder, MCT Powder (Milk), Raising Agent (Sodium Bicarbonate), Sweetener (Sucralose), Emulsifier (Soy Lecithin). Golden Syrup Flavour: Protein Blend (31%) (Whey Protein Concentrate (Milk), Milk Protein Concentrate, Egg White Powder), Ground Oats (13%), Flavouring, MCT Powder (Milk), Raising Agent (Sodium Bicarbonate), Sweetener (Sucralose), Emulsifier (Soy Lecithin). Maple Syrup Flavour: Protein Blend (31%) (Whey Protein Concentrate (Milk), Milk Protein Concentrate, Egg White Powder), Ground Oats (13%), Flavouring, MCT Powder (Milk), Raising Agent (Sodium Bicarbonate), Sweetener (Sucralose), Emulsifier (Soy Lecithin). Unflavoured: Protein Blend (35%) (Whey Protein Concentrate (Milk), Milk Protein Concentrate, Egg White Powder), Ground Oats (12%), MCT Powder (Milk), Raising Agent (Sodium Bicarbonate), Sweetener (Sucralose), Emulsifier (Soy Lecithin).